Carolyn Hamblin brought receipts and tax documents to Boston Medical Center to take part in a program called StreetCred, where professionals file tax returns while families get medical treatment. This year, Carolyn Hamblin is counting on her tax return. It’s one of the largest checks the single mother of five will receive all year. The 42-year-old, who lives in the South End, said she normally relies on her disability checks to get by. If she gets money back from the IRS, she’s careful how she spends it, devoting it to necessities: bills, clothes for her kids. “It’s everything to me,” said Hamblin, whose oldest child is 23. Her youngest is 8. Last year, an initiative called StreetCred helped Hamblin get her financial house in order for free — while her youngest son got his annual physical. It began as a pilot program in 2016 at Boston Medical Center. The creators of StreetCred are two pediatricians, Dr. Michael Hole and Dr. Lucy Marcil, who were worried about the money low-income parents were leaving on the table during tax season. So the physicians began learning about the earned income tax credit. Considered one of the nation’s largest antipoverty programs, the earned income tax credit benefits parents with low to moderate incomes. The tax credit returned more than $67 billion last year to low-income families, according to the IRS. The trouble is, not enough people take advantage of it. Families often miss out because they don’t know they’re eligible, or transportation barriers keep them from getting tax assistance, Hole said. 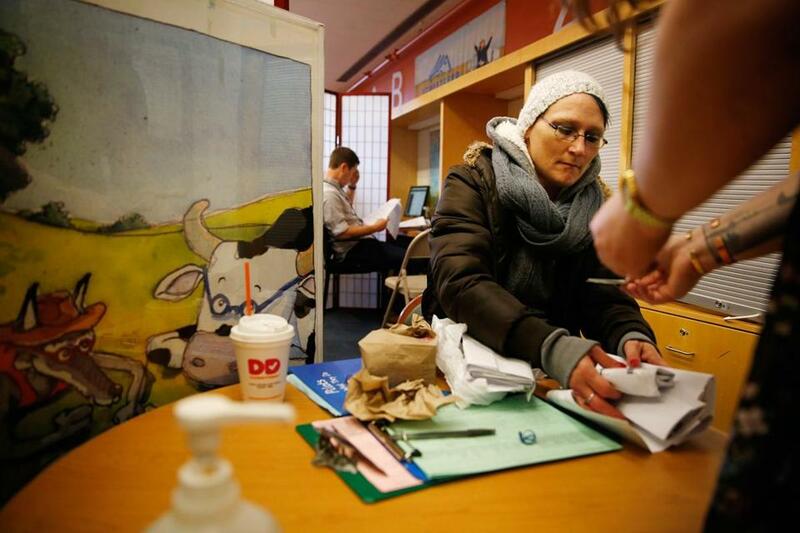 In collaboration with the Boston Tax Help Coalition, StreetCred marshaled dozens of tax preparation volunteers to come to Boston Medical Center —and several satellite locations this year — to help set up a one-stop shop: Eligible families get their taxes done and their kids can be seen by a doctor. The idea began with a mother of two who brought her newborn. At the time, the pediatricians could only refer her to a tax preparation center across town. She returned two weeks later and told them about taking two buses and a train, only to find the center closed. She tried to go back the next day, but ended up lacking a tax document, Hole said. Ultimately, the mother went to a for-profit tax company and paid hundreds of dollars. The pediatricians said her experience motivated them to help. Families are far more receptive to discussing their finances if their doctor recommends it, Marcil said. It’s created an environment in which doctors aren’t just treating patients’ physical ailments, but helping improve their quality of life. Hole said he never thought he would write the words, “I can’t wait for tax season to start” in an e-mail, as he did recently. The initiative served 186 patients last year and returned a little more than $400,000. On average, each family got about $2,000 back. So far this tax season, StreetCred has already surpassed $1 million in tax refunds returned to low-income Boston families, Hole said. The program costs $19,000. The main expense is the salary for a site coordinator, who has advanced tax training. The coordinator supervises volunteers, provides advice for more complicated returns, and reviews every return. The amount of money received depends on income, martial status, and number of children, according to the IRS. The more hours qualified families work — up to a certain amount — the more money they get back. Marcil said one mother was so excited, she was going to go to her boss and see if she could work more hours. Stephanie Peña, a community building coordinator, had just moved back to Boston from serving in the Peace Corps last year. She got married. She and her husband started new jobs in 2016 and moved to new cities. She wanted to make sure her taxes were done right. Julissa Bautista, 30, of Dorchester said she didn’t waste any time signing up for the program at St. Mary’s Center for Women and Children. The refund helped her pay down her last credit card and put money aside for car repairs, retirement, and college. The mother of two said the volunteers were knowledgeable and thorough. In the past, she paid hundreds to get her tax return done.